Over at T.H.E. 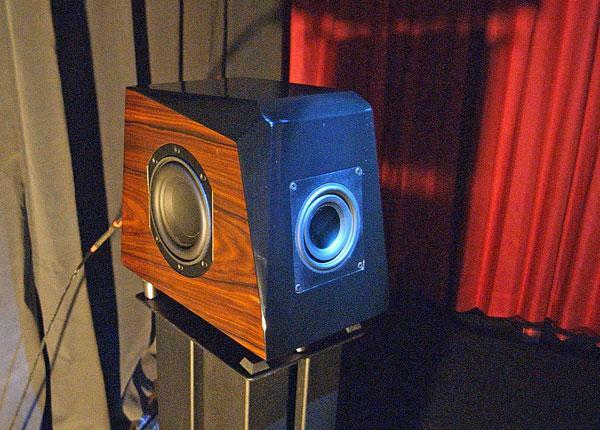 Show, Audience were demming the ClairAudient 1+1 bipolar speaker ($1800/pair), which uses two of the small full-range A3S drive-units developed by Roger Sheker, one on the front, one on the back, loaded with two passive radiators on the speaker's sides. The sound was dynamic, with surprisingly extended low frequencies. What if you don't like the sound of the violin? Every CES witnesses something out of left field. In the case of the 2013 Show, it was the ViolinSpeaker, which uses the body of a real violin to emit frequencies above 2kHz. (A conventional 6.5" woofer is concealed in the plinth.) 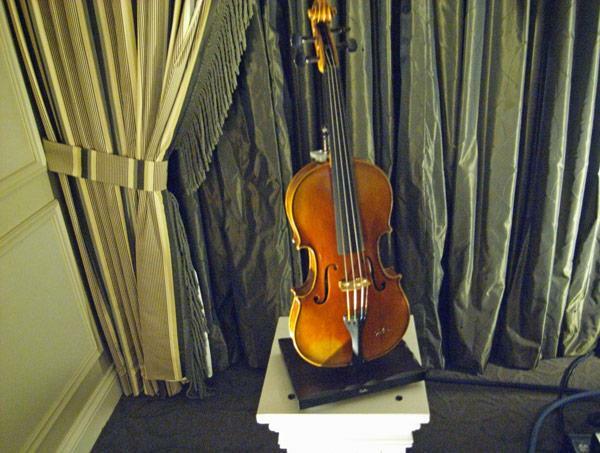 The ViolinSpeaker is offered at two prices: $7200/pair and $3800/pair, depending on the quality of the instrument chosen. The sound? Not as bad as I was expecting, but not very good either. 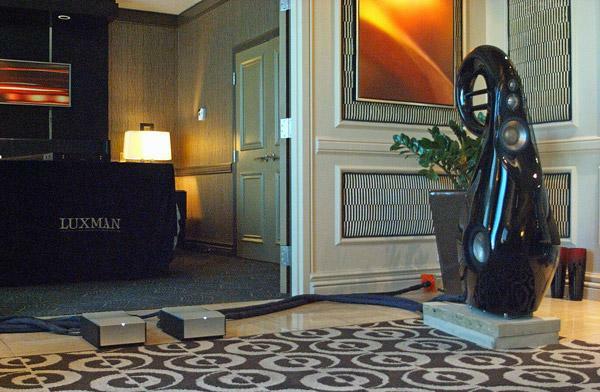 At this year's CES, Sumiko's John-Paul Lizars introduced me to REL Acoustics’ new R528 SE sub-bass system. 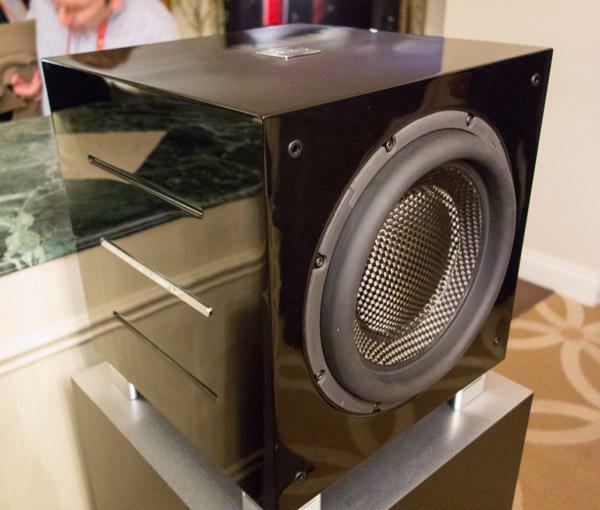 He described it as an "ultra-high output version of the R528" but also as a more compact version of the company's flagship Gibraltar 1 subwoofer. The R528 SE is half the weight (58 lbs instead of 108 lbs), 43% of the volume, and 61% of the cost of the G1 ($2750 instead of $4499). While the larger G1 has a 600W class-AB amplifier, the R528 SE has a 500W class-D amplifier. Both subwoofers utilize REL's aluminum-chassis, 12", carbon-fibercone woofer, but the R528 SE adds a downward-firing 12" passive radiator. Low-frequency response are not that different, with the R528 SE's 6dB point at 21Hz, and the Gibraltar 1's 15Hz. Many audiophiles and home-theater fans may end up favoring the more compact new subwoofer. McIntosh's exhibit area in the Venetian Towers was busier than usual when I entered, and I soon found out why. Whereas most manufacturers in high performance audio were content to introduce one or two products, McIntosh seemed determined to introduce many, many new products. I could not mention them all, but Ron Cornelius, McIntosh's Product Manager, helped me focus on four products he felt of greatest interest to audiophiles. First, he showed me McIntosh's new Digital Preamplifier ($2500, above). This featured a new ESS DAC chip that operates its 8 channels in differential balanced mode for improved resolution. It includes a headphone amplifier, and four digital inputs: two optical, one coax, and one high-speed, asynchronous USB port. 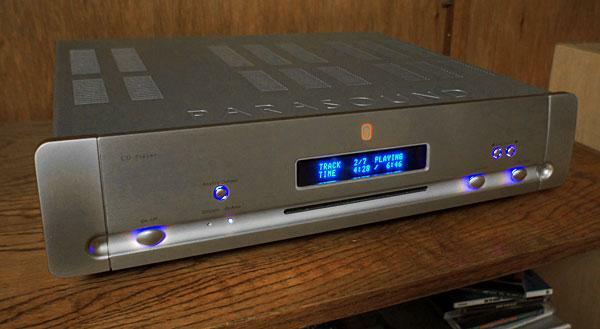 Parasound still thinks we can get more out of our CDs and worked with Holm Acoustics of Denmark to implement a CD ROM drive based player that is shipping now for $4,500. Inside the CD 1 is a Linux-based computer that analyzes the data coming off of the 4x speed drive. Parasound says that the computer keeps checking the data until it is satisfied it has a bit prefect stream. Balanced and unbalanced outputs are included as well as SPDIF for those looking to employ their own DAC. Following the sale of Thiel and the departure of the Kentucky company's cofounder Kathy Gornik at the end of November 2012, the Thiel display at the Sands Convention Center was packed. It was also reassuring to see many of the company's long-term employees on hand, confirming the new CEO Bill Thomas's commitment to preserving the brand's ethos. The evening before the show officially opened, I snuck into the Nola room at the Venetian. 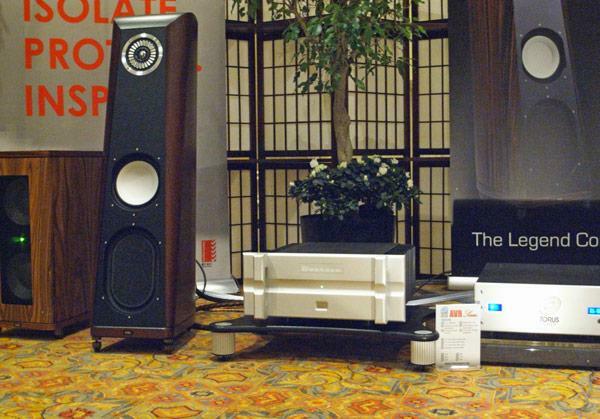 There I found the Long Island company's new Concert Grand Reference speakers ($197,000/pair), driven by an Audio Research CD8 CD player, Reference 10 preamplifier, and Reference 75 amplifier, hooked up with Nordost Odin cabling. A Quantum QX4 provided the system conditioning. I have no idea where the name came from, other than the fact that it’s a sunfish whose graphic likeness occupies the circle logo that replaces the dash between Mola1 and Mola2 in the house that designer Bruno Putzeys and company co-founder Jan-Peter van Amerongen have built. Nor can I pretend that Mola-Mola’s aesthetics are any more elegant than the name. But I can tell you that the company, headquartered in the Netherlands, manufactures amplification components whose sound, driving Vivid’s G3Giya speakers ($40,000/pair) brought me oodles of delight. 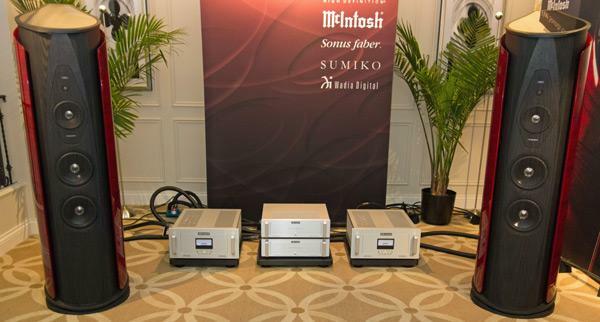 Audio Research had live demonstrations of a number of new products, including its new CD transport, the vacuum tube Reference CD-9 player ($13,000) and the vacuum-tube Reference 10 line stage preamplifier ($30,000). 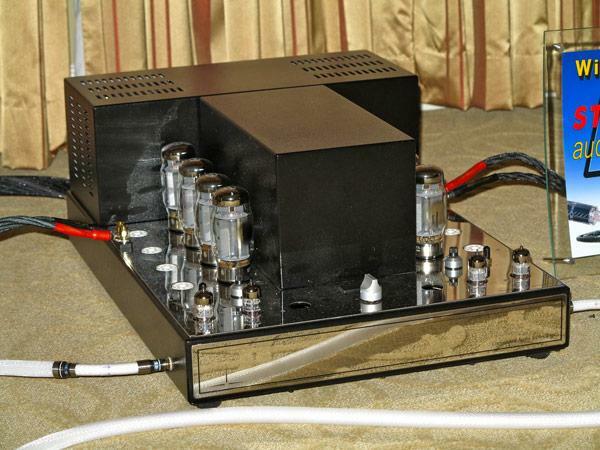 These were included in a system with their vacuum tube Reference Phono2 SE phono preamplifier ($13,000), their Reference D/A converter ($16,000), Reference 250 monoblocks ($26,000/pair), and a pair of DSM450M solid-state power amplifiers ($11,000/pair). 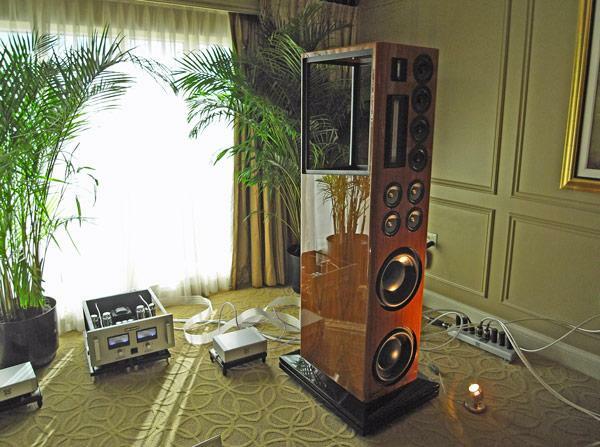 The Ref250s and DSM450s were used to bi-amp a pair of Sonus Faber Aida speakers. Specializing in user-friendly, wireless and desktop audio systems, Blue Aura is a UK-based company with manufacturing facilities in China. Though founded in 2010, the company gained presence in the US market just seven months ago. 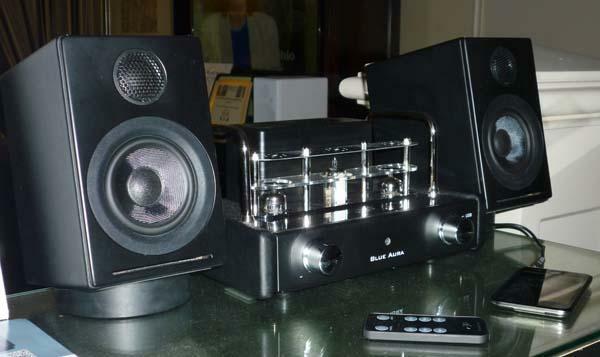 Here we see Blue Aura’s v30 Blackline system ($549), comprising 20Wpc hybrid vacuum tube amplifier and passive WS30 desktop speakers. 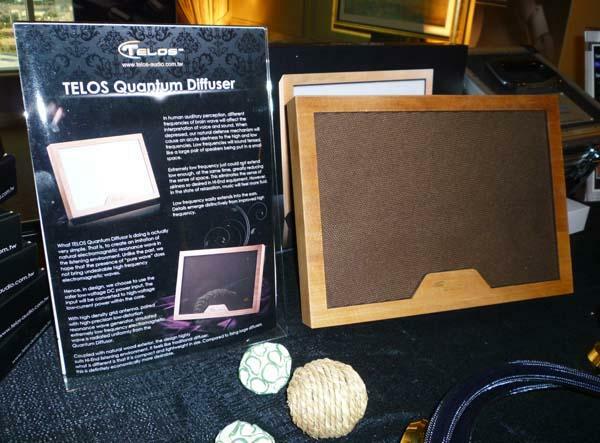 Handmade by carpenters in Taiwan, the Telos Quantum Diffusor ($600) is said to work on the air molecules of your listening room to “imitate natural electromagnetic waves.” The effect would be a more relaxed, soothing listening environment, putting the listener in a better mood, and consequently enhancing the sense of space and detail in the recording. 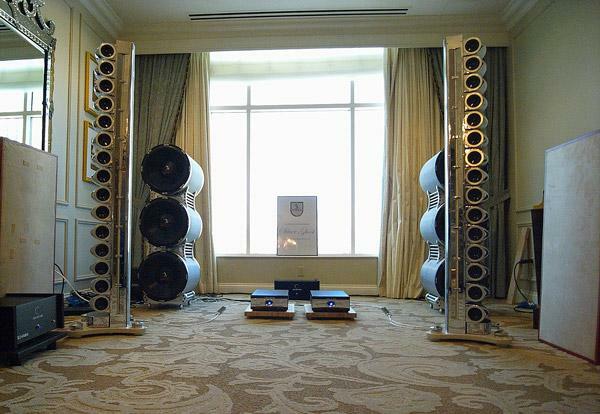 In short, the Telos Quantum Diffusor augments the listener’s perception of music. It is said to also improve sleep. “But you wouldn’t want to fall asleep while listening to music,” I kidded. 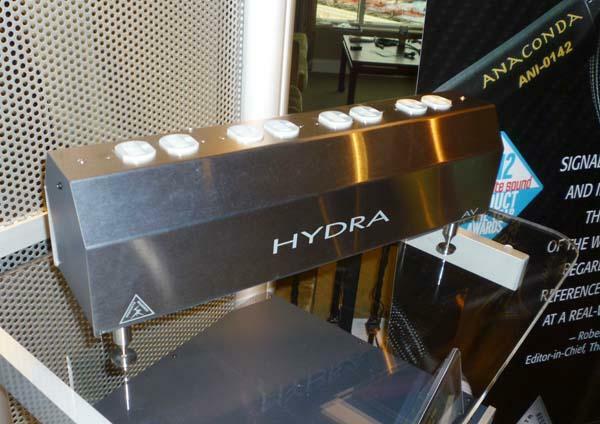 Shunyata’s Hydra AV power conditioner uses the same technologies found in the company’s Reference series Triton (reviewed by Michael Fremer in January 2012), but is intended for floor-mounted applications without sacrificing performance. Shown here is a prototype; final production should be complete in about one month and the price should be around $3000 to $4000. Based in Taiwan and sold in the US by Wavelength Audio Video, Puresonic specializes in high-performance A/V connectors. 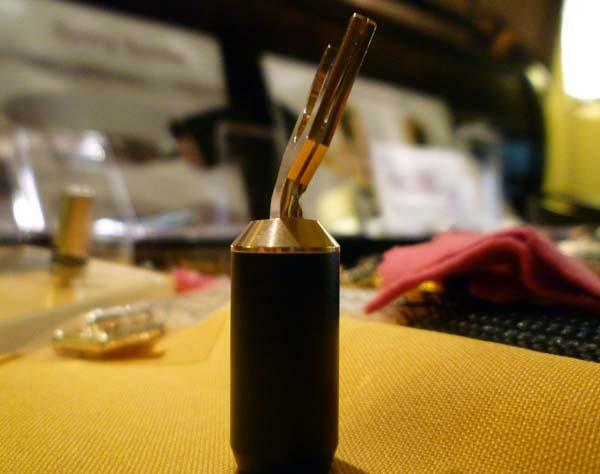 Their gold-plated “spring-spade” terminals have a patented spring-tension design to reduce the effects of mechanical vibrations, while their one-piece construction is said to improve high-current signal flow. I tightened this guy onto a binding post, and, sure enough, it wouldn’t let go. Think this is a photo of the forthcoming Convergent Audio Technology JL-5 power amplifier ($TBD, perhaps 10,000-12,000)? Think again. The new amp, still in prototype form, will have the same cosmetics but be ¾ the size. What is important, for those who love CAT's wonderful sound, is that it will be half the price of the company's former entry-level amp. A triode design using four KT120s per channel to output 100 Wpc, it paired beautifully with Wilson Audio Sashas and Stealth cables to produce gorgeous tonality on piano.